Hyperthyroidism is a common disease that was reported in about 1% of the human population with clinical sign of tachycardia, tremor, stare, sweating, and lagophthalmos and the most common etiologies of hyperthyroidism are Graves' disease and toxic nodular goiter. In Graves' disease, an antibody, thyroid-stimulating immunoglobulin, is produced and binds to thyroid-stimulating hormone receptors which promote cell growth and thyroid hormone secretion. In nodular goiter, hyperthyroidism could be induced from the hyperfunction of one or more nodules. Several methods are used in the process of diagnosis and treatment of hyperthyroidism including thyroid function tests, thyroid antibody studies, radioactive iodine uptake (RAIU), and thyroid scintigraphy. One of the potential therapies for hyperthyroidism is RAI-131 therapy. RAI therapy is performed by administration of I-131 which is a beta and gamma emitter radionuclide with a half-life of about 8 days. The emitted beta particles can induce apoptosis and cell death achieving therapy goals, and the associated gamma emissions can be simultaneously used for thyroid imaging and measurement of thyroid uptake. A radioactive dose of I-131 for the treatment of hyperthyroidism may be defined either by clinical estimation, using physical examination or by calculating of thyroid uptake (RAIU) first. RAIU includes measuring thyroid absorption using a small dose of I-131 may lead to the stunning of thyroid cells, which could prevent the optimal effect of treatment. Applying a small dose of radiation can increase the resistance of cells against damage from higher doses, this phenomenon is called radio-adaptive response which was reported in many studies in areas with high radiation background and confirmed in both in vitro and in vivo studies. The mechanism of radio-adaptive response is not well understood, but the immune system involved and seems it is a biological defense mechanism, in which low-dose ionizing irradiation causes cellular resistance to the genotoxic effects of subsequent irradiation. Chromosomal repair mechanisms and radioprotective agents are claimed to be involved in this process. The adaptive response could influence the success rate of treatment. Therefore, the study of radio-adaptive response phenomenon in hyperthyroid patients may be necessary. In this study, we aim to investigate the effect of pretherapy thyroid uptake on chromosomal aberrations and radiation resistance in following radioiodine therapy in patients with hyperthyroidism. We have studied 42 patients with Graves' disease, who were referred to the nuclear medicine clinic for RAI therapy, and 29 healthy men and women as a control group that did not have a history of radiation exposure. Exclusion criteria were pregnancy, lactation, and consumption of iodine-rich foods or medications. Forty-two patients (male = 12 and female = 30; mean age = 48.68 ± 13.96 years) were studied including 20 patients in RAI therapy with RAIU group (14 females and 6 males, with mean age = 50.0 ± 13.17 years and mean of weight 67.15 kg). Furthermore, 22 patients in the RAI therapy without RAIU group (16 females and 6 males, with mean age = 46.6 ± 14.7 years and mean weight of 66.59 kg) were included. At the time of referral to the clinic, all patients were given an iodine treatment readiness sheet. In the RAI therapy without RAIU group (Group 1), we first measured the amount of I-131 was requested by an endocrinologist using CRC® -25R Dose Calibrator (CAPINTEC, INC, USA). Then, we administered it to the patient. It is worth noting that these patients did not receive any I-131 doses before RAI therapy, and the dose was defined according to the patient's clinical examinations and varied from 296 to 444 MBq. In the RAI therapy with RAIU group (Group 2), we initially performed the RAIU for the patients so that we measured a capsule containing 0.37 MBq of I-131 by the Picker Gamma counter. We then administered it to the patient, 24 h after, treatment dose was calculated according to the Quimby-Marinelli formula which eventually determined 5.55 MBq of I-131 per gram of thyroid weight by a specialist in nuclear medicine. Finally, we measured the amount of iodine needed by the dose calibrator (Capintec), and we administered it to the patient (296–444 MBq I-131 entirely). We also studied a control group (N = 29, 18 females and 11 males; mean age = 34.76 ± 7.4 years and mean weight = 67.41 kg) who did not receive any diagnostic or therapeutic and occupational exposure and also they did not have any history of smoking, tobacco chewing, or alcohol consumption. The mean weight difference between the first and the second groups was not statistically significant which was essential for dose distribution of radionuclides. We used standard radioisotope dosimetry tables which were valid for adults (Annals of ICRP-80 1999). There was no drug used by donors for at least 1 month before sampling. For evaluation of chromosomal aberration, we have used micronuclei (MN) assay. Briefly, 5 ml of peripheral blood from a hyperthyroidism patient was collected in a heparinized vial 1 month after radioiodine therapy and cytogenetically evaluated using MN assay. 0.5 ml of whole blood was added to 4.5 ml culture medium (containing RPMI-1640 [Gibco-BRL] supplemented with 0.2 mM L-glutamine, 15% fetal calf serum [Gibco-BRL], 100 IU/ml penicillin, and 50 μg/ml streptomycin). Then, phytohemagglutinin (Gibco-BRL) at a concentration of 100 μl/5 ml was added to stimulate the division of lymphocytes in the samples. After 44 h incubation, cytochalasin B (100 μl/5 ml culture) was added. The cell flasks were further incubated at 37°C for another 28 h. The cells were centrifuged for 10 min (1200 rpm) then they were treated with 0.075 M KCl and were centrifuged for 7 min (1000 rpm). Then, the cells were fixed in a 6:1 mixture of methanol: glacial acetic acid and were centrifuged for 7 min (1000 rpm) which was repeated twice more. Then, the cells were dropped onto cooled, clean slides, and they were dried in the open air. Slides were stained with 15% Giemsa (Merck), and chromosomal aberrations were scored. The present study was approved by the Ethics Committee of Babol University of Medical Sciences. The written informed consent was obtained from the participants before the study. Statistical analysis was performed using one-way ANOVA for comparing age and weight of participants in three groups and Chi-square test was performed to compare gender and received dose frequency of participants. 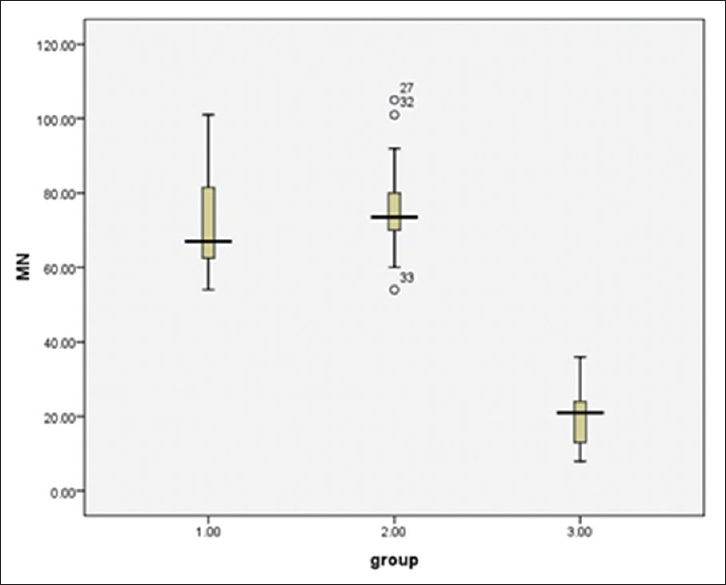 The Student's t-test (independent samples t-test) was used to compare the number of the micronucleus in binucleated lymphocytes between two radiation and control groups. To compare the number of the micronucleus in binucleated lymphocyte between two radiation groups, we used Student's t-test. In this study, the mean age of all participants was 48.68 ± 13.96 years. Furthermore, the mean age of the patients was 50.0 ± 13.17 years in the RAI with RAIU group and 46.6 ± 14.7 years in the RAI without RAIU group. Nevertheless, no significant difference was observed between the two groups (P = 0.512). The other demographic characteristics of radiations and control groups are presented in [Table 1]. In total, 28.6% of the patients were male and 71.4% were female. There was no significant difference observed between the two radiation groups in this regard (χ2 = 0.038, P = 0.845). Furthermore, comparison of the frequency of received doses indicated no significant difference between the groups (χ2 = 0.35, P = 0.554). The mean frequency of micronucleated-binucleate lymphocyte in the radiation and control groups is shown in [Figure 1]. Results also showed that the mean frequency of total chromosomal aberration in two groups was higher than controls, and in RAI therapy without RAIU group was higher than another group, but there was no statistically significant difference found between both radiation groups (t = 1.131 P = 0.265). The frequency of chromosomal aberration in peripheral blood lymphocytes of patients treated with radioiodine I-131 for hyperthyroidism, with or without previous thyroid RAIU with I-131, was studied. Our results showed that the mean frequency of total chromosome aberration in two groups was higher than control which was expected because of received radiation doses. Our results also showed that the frequency of chromosomal aberration in RAI therapy without RAIU group was higher than RAI therapy with RAIU group, but no statistically significant difference is detectable between two radiation groups. Based on the results of a study by Monfared et al., 99mTc in diagnostic doses did not increase chromosome aberration produced by subsequent exposure and surprisingly reduced the chromosomal aberrations resulting from the subsequent exposure to I-131. Thus, pre-exposure by 99mTc could induce resistance to a subsequent higher radiation dose of I-131 due to cytogenetic radio-adaptive response. Their results also are in agreement with the study of Ikushima et al. which have reported the cell adaptation by priming exposure with 5 cGy of γ-rays. Monsieurs et al. showed that a significant decrease in the in vitro induced MN in the blood sample after I-131 administration compared with that of the blood sample taken before therapy. They noted that adaptation could be achieved by the iodine therapy, in vivo, causing declination in the cytogenetic damage in peripheral blood lymphocytes after in vitro irradiation as a challenge dose. In the study by Gourabi, the cytogenetic responses of 24 medical radiation workers to 1–2 Gy γ-irradiation in comparison with 13 nonexposed persons have been studied. CBMN assay of lymphocytes revealed that although the frequencies of spontaneous MN in radiation workers are more than nonexposed, after 1–2 Gy in vitro irradiation of lymphocytes, this frequency was found to be lower for radiation workers. Shirani et al. examined CHO-K1 and lymphocyte cells that were individually exposed to different doses of γ rays. The frequency of MN increased significantly with increasing radiation dose in both lymphocytes and CHO-K1 cells. Nonetheless, they have reported that there was no significant difference between control and those exposed to 0.2 Gy. Coleman et al. investigated the adaptive cytogenetic response of human lymphoblastoid cell lines exposed to 5 cGy (priming dose) followed by 2 Gy (challenge dose) compared to cells that received a single 2 Gy dose. Moreover, by evaluation of gene expression, they concluded that low doses could produce radiation resistance. In the present study, we observed the difference between the groups regarding frequency of MN in lymphocytes which were lower in the RAI therapy with RAIU group, compared to the RAI therapy without RAIU group. However, this difference was not statistically significant; it seems that about 0.37 MBq dose of I-131 pretreatment had no significant impact on the frequency of MN in lymphocytes. However, the exact amount of I-131 doses required for inducing radio-adaptive response remains a matter of debate. Based on the results of this research, we found no significant difference between the study groups regarding the frequency of MN in lymphocytes, but due to the lower levels in patients who received fewer doses of the radionuclide, further studies are needed in this regard. We cannot approve the hypothesis that 0.37 MBq priming dose of I-131 for RAIU could induce a radio-adaptive response in lymphocytes of hyperthyroidism patients. This study was funded and approved by the Deputy of Research and Technology, Babol University of Medical Sciences. Fatourechi V. Hyperthyroidism and Thyrotoxicosis, in Endocrinology and Diabetes: A Problem-Oriented Approach. Springer: New York; 2014 p. 9-21. Lytton SD, Ponto KA, Kanitz M, Matheis N, Kohn LD, Kahaly GJ, et al. A novel thyroid stimulating immunoglobulin bioassay is a functional indicator of activity and severity of Graves' orbitopathy. J Clin Endocrinol Metab 2010;95:2123-31. Hegedüs L, Bonnema SJ, Bennedbaek FN. Management of simple nodular goiter: Current status and future perspectives. Endocr Rev 2003;24:102-32. Ravichandran R, Binukumar J, Saadi AA. Estimation of effective half life of clearance of radioactive iodine (I) in patients treated for hyperthyroidism and carcinoma thyroid. Indian J Nucl Med 2010;25:49-52. Stokkel MP, Handkiewicz Junak D, Lassmann M, Dietlein M, Luster M. EANM procedure guidelines for therapy of benign thyroid disease. Eur J Nucl Med Mol Imaging 2010;37:2218-28. Verburg FA. Clinical Studies on Treatment and follow-up in Differentiated Thyroid Carcinoma. Utrecht University; 2008. Monfared AS, Mozdarani H, Amiri M. Natural background radiation induces cytogenetic radioadaptive response more effectively than occupational exposure in human peripheral blood lymphocytes. Czechoslovak J Phys 2003;53:A791-5. Dimova EG, Bryant PE, Chankova SG. Adaptive response: Some underlying mechanisms and open questions. Genet Mol Biol 2008;31:396-408. Sasaki MS, Ejima Y, Tachibana A, Yamada T, Ishizaki K, Shimizu T, et al. DNA damage response pathway in radioadaptive response. Mutat Res 2002;504:101-18. Borzoueisileh S, Shabestani Monfared A. Natural background radiations, radioadaptive response and radiation hormesis. J Babol Univ Med Sci 2015;17:15-21. Fenech M. The cytokinesis-block micronucleus technique: A detailed description of the method and its application to genotoxicity studies in human populations. Mutat Res 1993;285:35-44. Monfared A, Amiri M, Mozdarani H, Moazzezi Z. Can previous thyroid scan induce cytogenetic radioadaptive response in patients treated by radioiodine for hyperthyroidism? Iran J Radiat Res 2004;2:69-74. Ikushima T, Aritomi H, Morisita J. Radioadaptive response: Efficient repair of radiation-induced DNA damage in adapted cells. Mutat Res 1996;358:193-8. Monsieurs MA, Thierens HM, Vral AM, Van De Wiele C, De Ridder LI, Dierckx RA, et al. Adaptive response in patients treated with 131I. J Nucl Med 2000;41:17-22. Gourabi H, Mozdarani H. A cytokinesis-blocked micronucleus study of the radioadaptive response of lymphocytes of individuals occupationally exposed to chronic doses of radiation. Mutagenesis 1998;13:475-80. Shirani S, Mozdarani H, Mahmoodzadeh A, Salimi M. Radio-adaptive response of peripheral blood lymphocytes following bystander effects induced by preirradiated CHO-K1 cells using the micronucleus assay. Int J Radiat Res 2015;13:151-6. Coleman MA, Yin E, Peterson LE, Nelson D, Sorensen K, Tucker JD, et al. Low-dose irradiation alters the transcript profiles of human lymphoblastoid cells including genes associated with cytogenetic radioadaptive response. Radiat Res 2005;164:369-82.